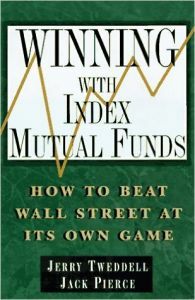 In clear and friendly language, the authors take you step by step through index funds in every category. These specialized mutual funds are tied to established target indexes like the Standard & Poor's 500 or the Dow Jones Industrial Average. In effect, then, Wall Street does the work of mixing and matching representative, high-quality stocks for index mutual fund buyers - without its usual sales loads and annual expenses. Fully 99.7 percent of your money goes directly to work for you. Jerry Tweddell (Sonora, CA) is a former stockbroker with twenty years of experience in both individual and institutional investing. He is presently a registered investment advisor offering consulting services to individual investors in index funds, no-load funds, and U.S. Government securities. Jack Pierce (Greenbrae, CA) spent over 30 years as a stockbroker and regional manager with major Wall Street firms. He retired recently from Donaldson, Lufkin, & Jenrette.